In order to pull out the innards of the redundant reactor which once fed power into the national grid, DSRL's design engineers have had to come up with some pretty ingenious inventions since the reactor was switched off. Now a giant seventy-five tonne prehistoric looking device with two large pincer arms and roving photographic eyes, affectionately nicknamed 'Reactorsaurus' by the project team, has been designed to dismantle the plant. Due to the environmentally hazardous conditions the stripping out work needs to be carried out remotely. The project team will initially trial a life-sized simulated model of the remotely controlled manipulator in an off-site purpose built test facility, replicating the circular reactor roof and three sectors of the reactor core. This will also allow them to develop techniques and processes for the size reduction and removal of the reactor components, simulating the challenges that will be encountered when the actual work starts. Reactorsaurus is a large traversing carriage which incorporates a set of two remotely operated manipulators with robotic arms reaching sixteen metres down into the reactor vessel. Activated from a central control room, these arms are able to operate an array of size reduction and handling tools, such as diamond wire and disks, hydraulic shears, oxy/propane and plasma cutting. There is an integral camera system built in to the device, with six radiation tolerant cameras that will relay images and sound back to the control room. Jared Fraser, head of the design team, said: "Completion of the design phase of a complex and unique piece of equipment like this is a credit to the entire team who have worked tirelessly for the past year. The considerable skills and knowledge required to create apparatus of this nature is immense and a challenge that has been well met by our design engineers." The contract for the construction of the mock up will be awarded later this year, with construction expected to take a further two years to complete. The real thing will be ready in 2013 when commissioning will begin within the reactor itself. Simon Coles, PFR projects delivery manager, went on to add: "The reactor dismantling project is critical to the Nuclear Decommissioning Authority's site restoration plan for Dounreay. 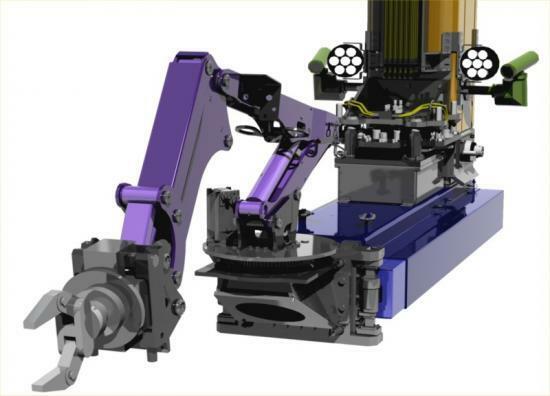 The expertise within our highly skilled in-house design team is invaluable to the PFR project delivery and innovative inventions like Reactorsaurus is one of the reasons Dounreay 's leading the way with worldwide nuclear decommissioning."